The snow-white soldier of Grand Falls - A December ghost story. Section commander: Eric Ellis (seated 2nd row, 3rd from left); Hussey (seated 2nd row, 4th from left); Henry Ethelburt Moss (back row, 4th from left) Courtesy of the Rooms Provincial Archives Division (A 8-34), St. John's, NL. The email was from a man named Terry from central Newfoundland, mentioning a ghost he had seen when he was 10 or 12 years old. “We left my uncle’s house in Grand Falls late one night to return to Bishop’s Falls,” he started the tale. Terry’s father and mother were in the car, along with his sister. As they drove out of Grand Falls heading back towards their home, they drove past an old graveyard. I asked Terry if he looked like a modern soldier, or if he had to guess, what era or war the soldier looked like he was from. Needless to say it was many years before Terry looked at that graveyard after dark. 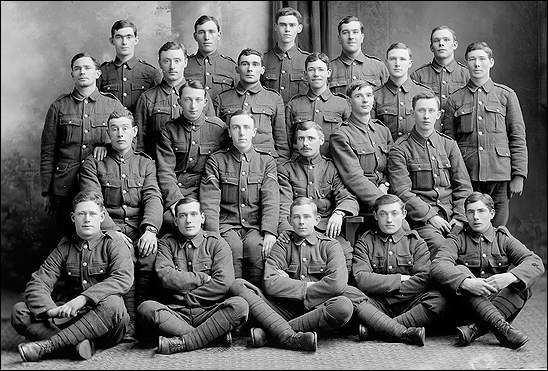 Certainly, young men from Grand Falls with names like Frampton, Goodyear, Goudie, Hann, and others, all served in the Newfoundland Regiment during the first Great War. Many of them never returned home. Is it possible that a battle-weary ghost still walks the graveyard in Grand Falls? If you feel you might have some light to shed on the subject of the mysterious soldier of Grand Falls, drop me an email at info@hauntedhike.com.